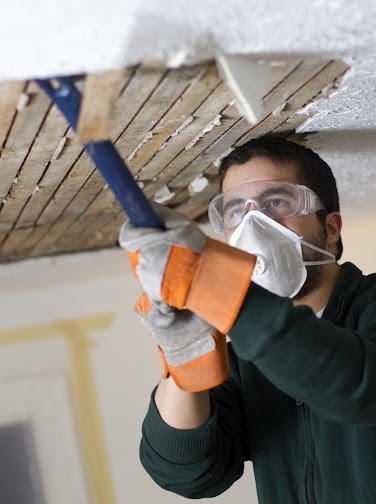 Getting your popcorn ceiling completely removed isn’t a problem for “Drywall Repair in Azusa”. It is what our business to know how to removal this type of ceiling. Although it was a very popular technique in the 60’, 70’s and early part of the 80’s, it is no longer popular today. In fact, it has become somewhat of an eye sore to many homeowners. If this is a problem for you, and you want to do something about it, why not contact us and find out what we can do for you. Some people simply go on living with this type of ceiling because they fear the expense will be far too excessive. However, we will work with any budget to get you the help you need to have your popcorn ceiling removed. In addition to having the popcorn ceiling removed for aesthetic reasons, some people have it removed for fear of being exposed to asbestos. Asbestos contains microscopic fibers, which have been proven to be fire, heat chemical resistant. It is for this reason that it is used in the certain industries. When the fibers from the asbestos are air born, they get in your lungs and over time will cause you serious health issues. Some forms of cancer have been associated with asbestos. Drywall Repair in Azusa is able to conduct the necessary tests to determine if your popcorn ceiling actually has asbestos in it. If your ceiling was constructed prior to 1980, there is a good chance that your ceiling will have asbestos in it. This isn’t to alarm you, it is simply to make you aware of the health problems that you may have due to asbestos in your ceiling. As a professional popcorn ceiling removal service, we are capable of effectively removing this type of ceiling without any further damage to you or your family. If you or a family member has unexplained health symptoms, consider the fact that it could be coming from your ceiling. Asbestos isn’t something you can see and that is why it is important to let us determine for certain, if there are traces of asbestos in your ceiling. Call today and receive our expert services and advice.